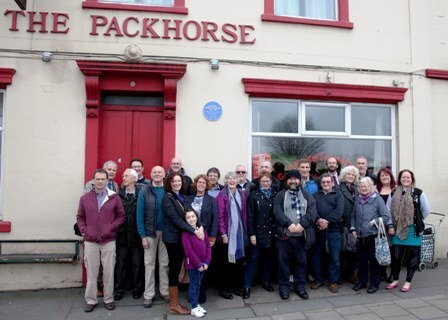 On 20th February 2017, an unveiling took place at the Packhorse Inn, on the Lawrence Hill railway bridge at Church Road. The plaque tells a fascinating story: William Herapath was the son of the publican and grew up here in the early years of the nineteenth century. He took over the running of the pub and the task of fermenting his beer whetted his interest in chemistry. He went on to develop an impressive CV, become a founder member and fellow of the Chemical Society of London, professor of chemistry and toxicology at the Bristol Medical School and vice-president of the Bristol Political Union. So – the plaque honours a remarkable, pioneering man: at the forefront of forensic science generally, and administering anaesthetics specifically, as well as active in local politics. Descendants of William Herapath, members of the Barton Hill History Group and of the Bristol Medico Historical Society as well as local people attended the ceremony. We toasted the great man in the Packhorse Inn bar and enjoyed a light buffet kindly provided by the landlady, Tracey Carty. Professor Brian Vincent, himself a chemist, from the University of Bristol, delivered a tribute.